ANPSA and its affiliated Societies have a range of material on Australian native plants available for download. Some material is available directly from this site while other information is located on external sites. For convenience a list of available information has been compiled below. 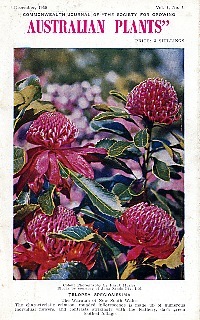 'Australian Plants' Vol. 1 No. 1 - the very first issue of the Society's colour journal dating from 1959. 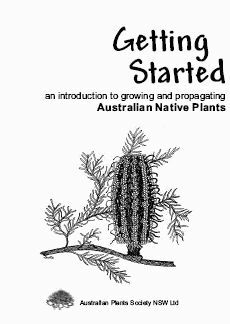 'Getting Started' - a booklet aimed at the new grower of Australian native plants. 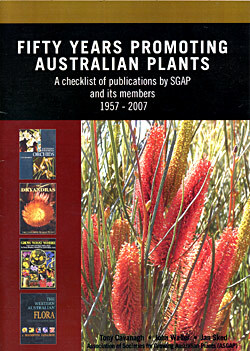 'Fifty Years of Promoting Australian Plants' - a checklist of publications produced by the Society. 'APS Query' - a free program for Windows which enables the selection of Australian native plants to suit specific requirements. Australian Native Plant Brochures - compiled by members of our Queensland Region. Back issues of Gumnuts - ANPSA's previous email newsletter. Those who have been members of any of the member Societies of ANPSA for any length of time will know that its primary publication is the journal 'Australian Plants' which was first published in December 1959. If you've ever wondered how it all began, Volume 1 Number 1 is now available for download. However, be aware that it's a large download (about 10MB) because it's been scanned at a resolution large enough for legible printing. You will need a PDF Reader such as Foxit Reader or Adobe Acrobat Reader to view the file (both are free downloads). 'Australian Plants' has been in continuous publication for over 50 years with well over 200 issues. Needless to say, finding particular articles of interest can be difficult. To assist readers, index files have been created. These now cover Volumes 1 to 25 (issues 1 to 205). 'Getting Started' is a 32 page publication aimed at the new grower of Australian native plants (although more experienced growers will find some useful information as well!). You will need a PDF Reader such as Foxit Reader or Adobe Acrobat Reader to view the file (both are free downloads). ANPSA's Member Societies have been active in print publishing almost since the Society's inception. Over the years literally hundreds of publications have been produced ranging from simple brochures and pamphlets aimed at specific local areas to full commercial titles. More recently, a number of titles have been produced on compact disc. Books initiated/organised/sponsored by Bill Payne and the Publishing Section under the guidance of the Society for Growing Australian Plants, NSW Ltd.
'APS Query' is a computer program for Windows which enables the selection of Australian native plants to suit specific requirements. APS Query uses a database created and maintained by the Australian Plants Society (S.A. Region, Inc), which contains descriptions of over 6000 native plants. Most are proper species, but also includes a number of common hybrids and cultivars. The database has been developed with emphasis on plant characteristics in Mediterranean to semi-arid climatic conditions. It will best relate to South Australian conditions, and is reasonably close for Western Australia and Victoria. However, it may be less accurate for eastern seaboard environments. Extensive suite of search key criteria, divided into categories. On-screen view of a Brief Information Page for all plants matching the specified criteria. On-screen view of a Full Information Page for plants selected from the Brief Information Page. Ability to save information as files, or to print any selection from either plant list. Option preferences are stored in the Windows Registry. Font selection (including colour) is independently defined for the Information Pages. Quick Preview (via a separate window) of Full Information. Quick Search for a known Genus and species, a Basic criteria selection, or for Keywords. Ability to display photographs of selected plants. Note: The download link goes directly to the APS Query website. Plant an Aussie Plant Today - General advice on growing Australian native plants. Down the Garden Path with 'Aussie Plant' - Lists of Australian native plants suitable for South-East Queensland. Australian Plants for Containers - General advice and lists of Australian native plants for growing in containers. How to Attract Native Birds to your Garden - General advice and lists of appropriate plants. How to attract Butterflies to your Garden - General advice and lists of appropriate plants. Growing Grevilleas - General advice and lists of varieties suitable for South-East Queensland. Wattles are Wonderful - General advice and lists of varieties suitable for South-East Queensland. Native Plants for Frog Friendly Gardens. Note: The download link goes directly to the download page on the Queensland Region's website. The Study Groups established by the Society produce regular newsletters to document the work of members and to provide information on cultivation, propagation and other information for the particular plants being studied. Further information on the work of the Study Groups is available here. "Gumnuts" was an email newsletter published from 1997 to 2004. Each of the archive files below contains about 10 issues of the "Gumnuts" newsletter compressed in ZIP format. To expand (decompress) the ZIP file you will need an "unzipping" utility. These are readily available as freeware and shareware from the many online software libraries. Most computer magazine cover disks will usually include a suitable utility. An excellent utility for Windows users is Freebyte Zip. After downloading the article(s), use the unzipping utility to expand the files to a suitable location on your hard disk. Issues 1 to 30 are in HTML format. After decompressing, these issues should be loaded into your favourite web browser for viewing. Issues 31 onward are plain text files. After decompressing, these issues can be viewed in any wordprocesser or in most text editors. The 'Gumnuts' email newsletter was replaced in May 2006 by a blog which itself went into recess in October 2009. Past issues of the blog are still available for viewing via the Australian National Library's Pandora Web Archive.